Join us for an evening of great music in Willimantic! This show is a benefit for CLiCK and Vulturetown Arts. Owen Taylor and Julia Steele Allen on guitar, banjo and vocals. 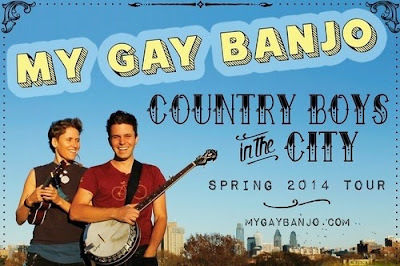 Singing homespun gay-themed duets and occasional queered-up mash-ups, My Gay Banjo plays songs for you and your kind. MGB is based in NYC and Philly. Patchwork Symphony is a recently formed musicians collective centered around Brentley Hartman (saxophone, drums, percussion), Alex P. Wernquest (guitar, bass, voice), and Wesley Nichols (guitar, bass, piano, voice). The not-an-actual-Symphony (although one can dream) was founded on improvisation and collaboration, incorporating the sound patches provided by long-term visitors and one-time guests.